The joint rescue management / dispatching tasks are carried out by the National Ambulance Service’s Operating Group of Zalaegerszeg. The service area of the Central medical service is Hévíz, Alsópáhok, Felsőpáhok, Nemesbük and Zalaköveskút. It serves the guests staying in the town and those who come upon. During the on-call time the paediatrician, after being called, is required to appear on the spot of the phone call within 30 minutes and provide medical attendance. The Emergency Dental Service is provided by the IV. DENTAL LTD in Zalaegerszeg based on an agreement on attendance. The Local Government of Hévíz performs a higher level of medical care by providing the Central Medical Service, whose operation hopefully will be to your and our town’s guests’ satisfaction. The emergency medical attendance is provided free of charge for both Hungarian citizens and citizens coming from EEA member states and also outside the EEA region (Russia, Ukraine). Hévíz, Kossuth út (Kossuthova ulice) 5. Hévíz, Vörösmarty u. (Vörösmartyho ulice) 14. Hévíz, Dr. Schulhof Vilmos sétány (Promenáda Dr. V. Schulhofa) 1. OTP Hévízi Fiók (Hévízská pobočka Zemské spořitelny): Erzsébet királyné utca (Ulice královny Alžběty) 11. 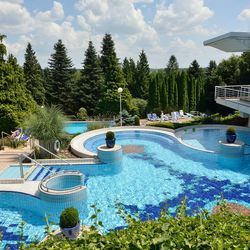 Hlavní vchod do Danubius Health Spa Resort (Lázně Danubius): Kossuth u. (Kossuthova ulice) 13-15. Hévíz és Vidéke Takarékszövetkezet (Družstevní záložna města Hévízu a okolí): Széchenyi u. (Széchenyiho ulice) 66. Kereskedelmi és Hitelbank (Obchodní a úvěrová banka): Rákóczi u. (Rákócziho ulice) 13/15.